Following years of retrenchment among prospective first-time homebuyers and the dampening effect it has had on the recovery of the housing market, first-timers will return to the market next year, according to the realtor.com® 2015 Housing Forecast released Dec. 4. This is among several key developments projected for the coming year by realtor.com®, a leading provider of online real estate services operated by News Corp subsidiary Move, Inc., in a report that includes predictions for home prices, home sales, mortgage rates, and affordability, as well as the Top 10 Markets for Housing Growth. Millennials will drive household formations: Both population and households have grown at a slightly higher pace in 2014 and this trend will continue in 2015 with modest improvement over this year’s increases. Households headed by millennials will see significant growth as a reflection of economic gains. Millennials will also drive two-thirds of household formations over the next five years. Next year’s addition of 2.75 million jobsand increased household formation will be the two key factors driving first-time buyer sales. Existing home sales will increase +8%:Existing home sales will grow as more buyers enter the market motivated by a clear belief that both rates and prices will continue to rise. The increase in home sales year-over-year will be similar to 2012, but this time the composition of properties sold will be more normal with minimal levels of distressed properties. 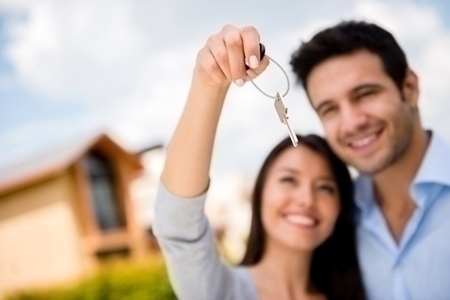 While the majority of housing activity next year will be driven by baby boomers preparing for retirement, millennials will account for 65 percent of first-time home buyer sales in 2015. Home prices will gain +4-5%: Low inventory levels and demand driven by improved employment opportunities will push home prices up next year. 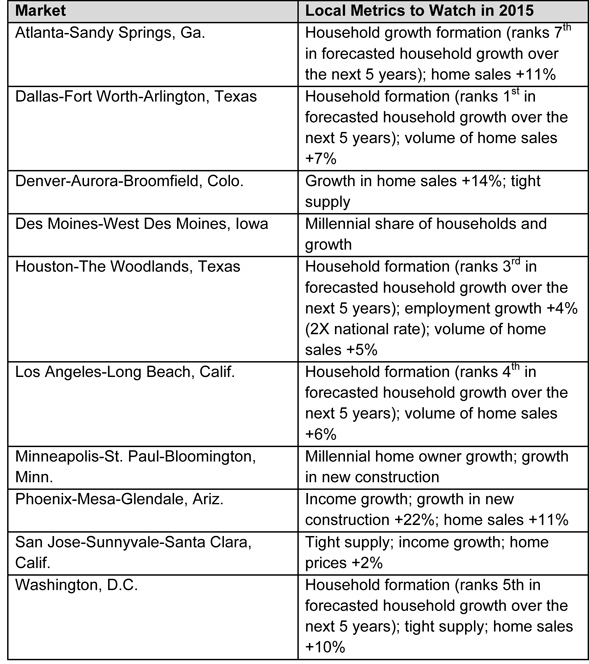 While first-time home buyers have many economic factors working in their favor, increasing home prices will make it more difficult to get into high priced markets such as San Francisco and San Jose, Calif. As a result, first-time home buyer activity is expected to concentrate in markets with strong employment and affordability, such as Des Moines, Iowa; Atlanta and Houston. Mortgage rates will end the year at 5%: Mortgage rates will increase in the middle of 2015, as the Federal Reserve increases its target rate by at least 50 basis points before the end of the year. Thirty year fixed rate mortgages will reach 5 percent by the end of 2015. One year adjustable rate mortgages (ARMs) will rise minimally. Lower ARM interest rates will influence an uptick in buyer interest for adjustable and hybrid mortgages. While still at historic lows, rate increases will affect housing affordability for first-timers trying to break into the housing market and will be another factor pushing them to less expensive locales. Home affordability will decrease 5-10: Affordability will decline in 2015 by 5-10 percent, based on home price appreciation and increasing mortgage interest rates. This decline will be somewhat offset by increasing incomes. When considering historical norms, housing affordability will continue to remain strong next year. 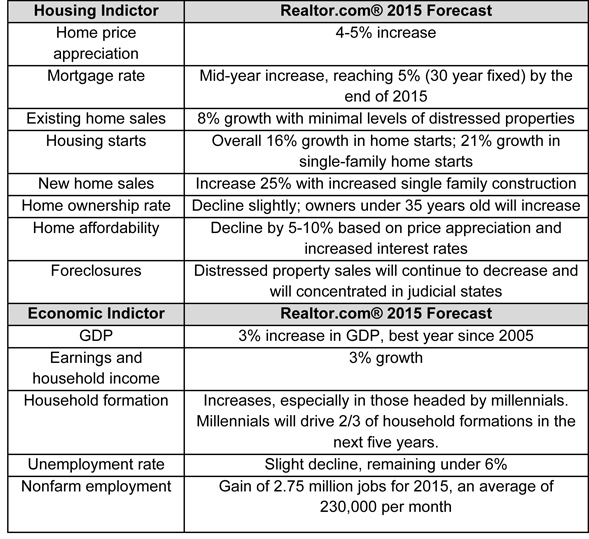 Realtor.com®’s outlook for gross domestic product (GDP) and home sales and prices is more optimistic than the National Association of REALTORS®’ forecast, which projects existing-home sales to rise 5 to 7 percent and home prices to increase 3 to 4 percent, based on GDP growth of 2.5 to 2.8 percent. On Dec. 9, 2014 at 3 p.m. ET Jonathan Smoke, chief economist for realtor.com®, will host a Google Hangout discussing his expectations for mortgage rates in 2015. To join the hangout, sponsored by PrimeLending, click here.